Having trouble organizing your makeup accessories? Here are 20 easy DIY Makeup organizer ideas that will solve this problem for good. Makeup accessories can make quite a mess if they’re not organized. They can clutter up your bathroom and your bedroom. Needless to say, it’s a problem to be solved as soon as possible. Luckily, you can take this opportunity to not only organize better but decorate your home as well. We offer 20 DIY makeup organizer ideas to get your accessories in order while making your home decor look good as well. These projects will give you some great options on how to turn a mess into statement decor! Loving makeup is one thing, but organizing it can sometimes seem like a stretch! Well, not anymore! Here is a fun DIY makeup organizer project to keep all your cosmetic essentials in place. To make it, you’ll need a piece of fabric, a hanger, scissors and a soft plastic sheet. 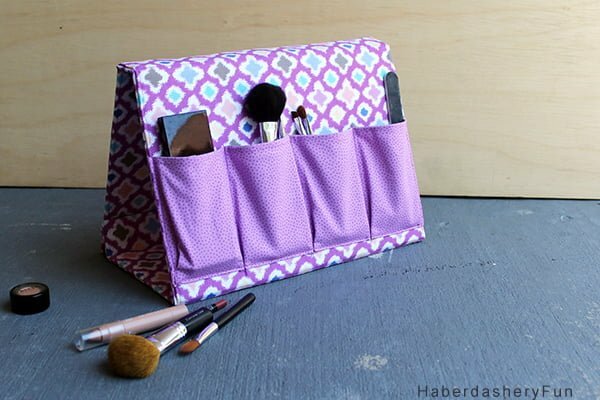 Use your fabric as the base of your makeup holder. You’ll also need to cut out bindings and attach them to the plastic pockets accordingly. Finally, use your hanger to complete the project and hang it wherever you need it! 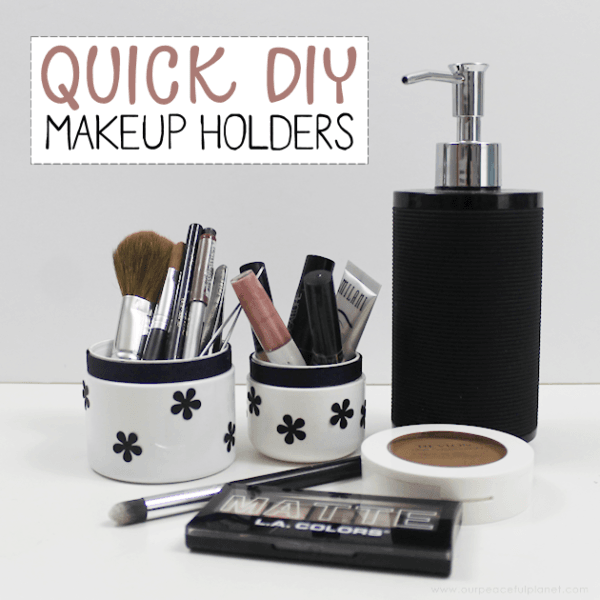 Simple and easy to do, this DIY project will give your makeup a whole new look! If you simply cannot find a suitable space for your makeup brushes, here is an idea to get you going! This simplistic, yet effective DIY project is easy to do and won’t hit your pocket too hard. 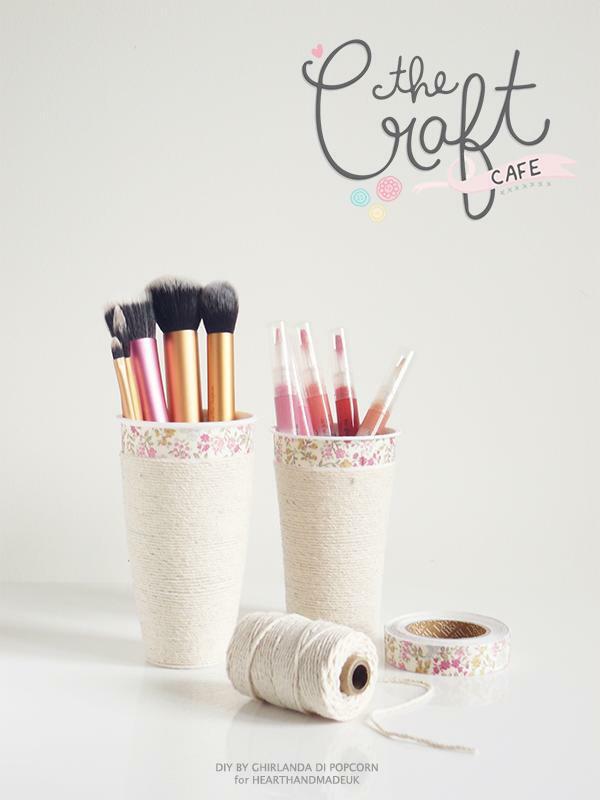 To do it, you’ll need a few essentials, such as a thick glass vase, Washi tape, pebbles and some imagination. The basic idea is to create a dynamic vase, filled with pebbles to hold your brushes in place. Use your preferred Washi tape to create a striped-like design, and don’t be scared to use a few fun stickers as well! Easy-peasy! It’s truly incredible to learn what magnets can do, and especially in terms of organizing your makeup. If you still haven’t figured out how to put your makeup in the spotlight, have a look at this ravishing magnet board makeup holder! What you’ll need for this project includes an old photo frame, and a tin base, fit to your frame. It’s now time to play around, so gather your makeup essentials and glue small magnet pieces on each. As soon as you’re done, you can freely stick all your products on the board and hang it anywhere in the house. Bravo! Glitter will never go out of style, and when done right, it can be used for multiple purposes! Let’s have a look at this cheerful and lady-like makeup tray that explodes with boldness, color, and charm. To do this project just right, you will need an old shoebox lid, some glitter, and velvet paper for wrapping. First, wrap your shoebox lid in your preferred velvety paper. Next, create a dynamic zigzag pattern using masking tape. Use glue to attach the glitter onto the surface, and remove the tape once done. Finally, cut out a plastic sheet to fit your lid and press down to secure! Amazing! Old-school DIY projects look great when done with a twist, and this DIY makeup brush holder is here to testify to it! This vibrant idea will not only boost your craftsman skills but create a wonderful makeup brush organizer as well! The bits needed for this idea include a sushi mat and a lengthy elastic band. 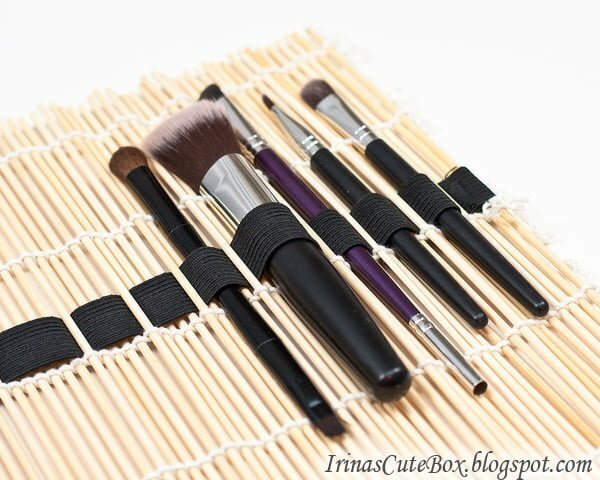 What you need to do is knit the elastic band throughout the sushi mat, thus creating pockets for your brushes. Feel free to stitch or glue the band’s ends if necessary. Simple, artistic and portable (it folds! ), this organizer might become your new best friend! 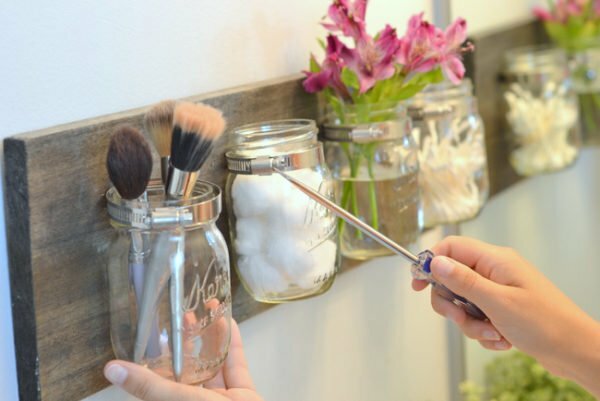 Pretty DIY projects will always be ‘in,’ and this makeup brush holder is no exception! If you are still looking for the perfect makeup brush holder, you just found it! For this DIY project, you’ll need a few key supplies, like a fabric of your choosing, an elastic band, and an experience in sewing. Lay out your brushes to estimate the amount of fabric you’ll need for your base and brush pockets. On to sewing, make sure you are precise and thorough when putting the pieces together. This brush kit is foldable and practical to use, making makeup look more organized than ever! 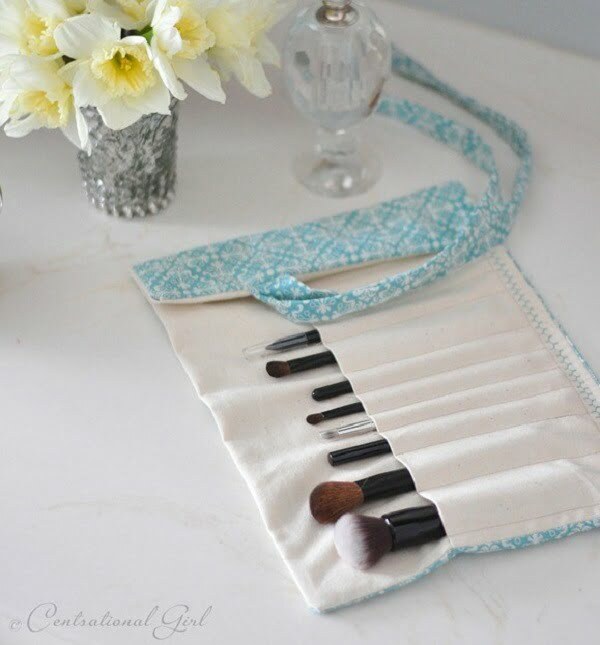 Leather and makeup match well, so why not recreate this elegant DIY makeup brush holder? With no more than an hour of work, you’ll be able to create the perfect holder for your makeup brushes, and still keep your spendings to a minimum. Creating this DIY idea requires a few elements, such as a piece of faux leather, satin lining, fusible interfacing and a satin ribbon for the full effect. 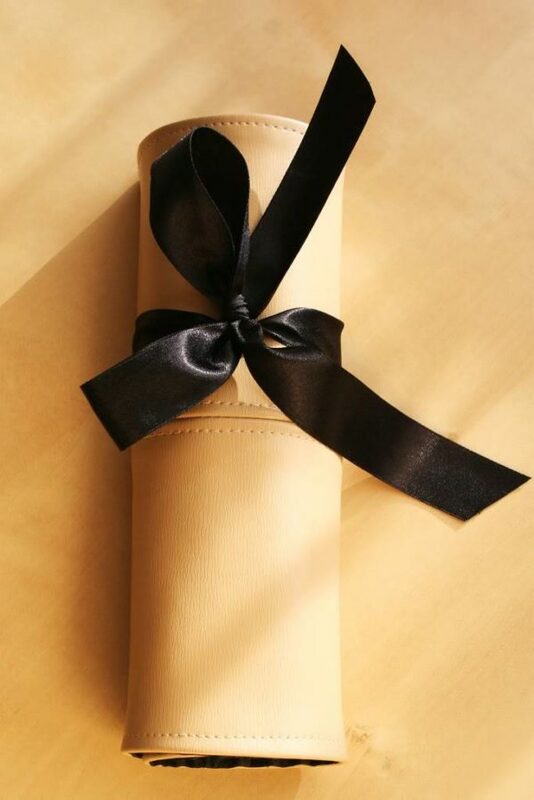 The leather is a specific material, so make sure you pay attention to the sewing skills involved in this concept. Let’s get creative, shall we? Mason jars have are among the most versatile items to work with, especially in DIY projects. When it comes to makeup organizers, this cheeky and retro Mason jar DIY project is nothing short of amazing. First off, you will need a handful of Mason jars, hose clams, a wood plank, photo hanging kit, and a few other relevant elements. Stain or paint your wood to match your walls, and use picture hangers to attach your Mason jars to the wood. Make sure you secure everything in place well and get ready to take DIY makeup organizers to a whole new level! 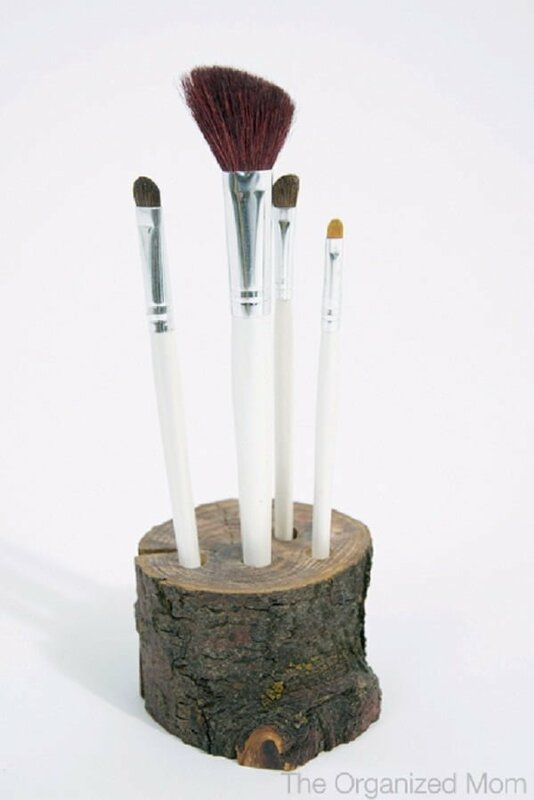 Original DIY projects should never go to waste, so let’s have a look at this brilliant makeup brush holder that uses wood as its base. This is an interesting project to do, as it’s favorable for both your budget and the elements needed. Find a piece of round wood, as well as a drill to make your holes. Choose a stump sized to fit all your makeup essentials. Then, drill holes deep enough to hold your brushes, without piercing the wood all the way through. Yes, you did it, and may we just say – it looks incredible! 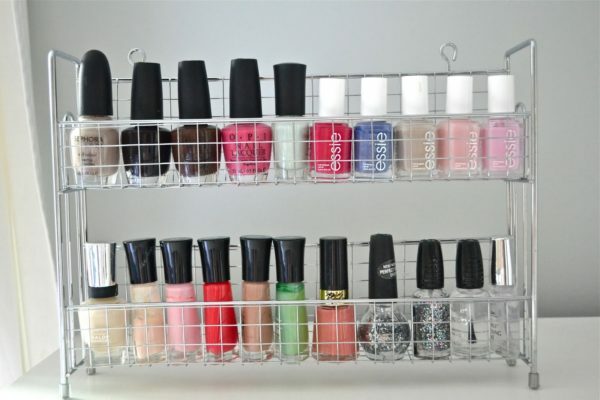 If you have a handful of nail polishes lying around your bedroom, let us fix that by presenting this marvelous DIY organizer idea! Truly, this may be one of the simplest ideas you never thought of before. As far as practical and easy DIY projects are concerned, this one is a true knockout. The only element you need to clear up the makeup mess in your room is a metallic spice shelf, which can either be a fixed one or one you can hang on your bedroom wall. Clean, fitting and affordable, this project is bound to make an impact! Cups are not just for coffee anymore! 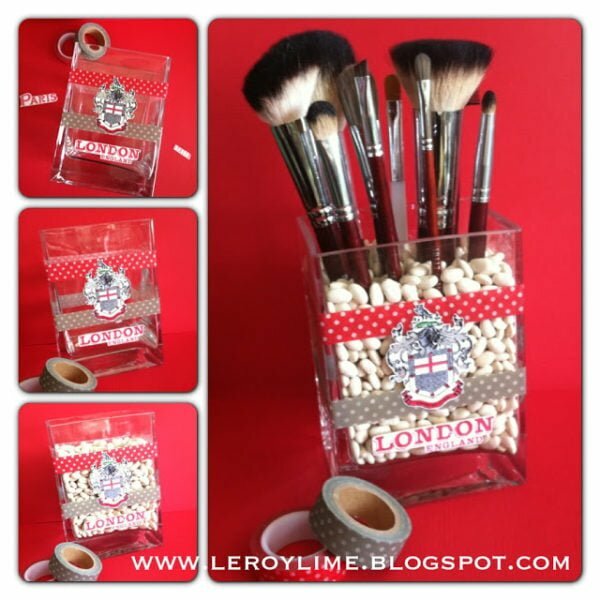 To prove that, have a look at this romantic and adorable DIY makeup organizer! As simplistic as the idea may seem, this cup makeup holder is perfect to gather all your cosmetic pieces in one place. To make it, you will need tall plastic cups, scissors, cotton twine, fabric tape and some glue. Begin by gluing your fabric tape at the top of your cup. Next, use the cotton twine and basically glue and wrap your cup with it. 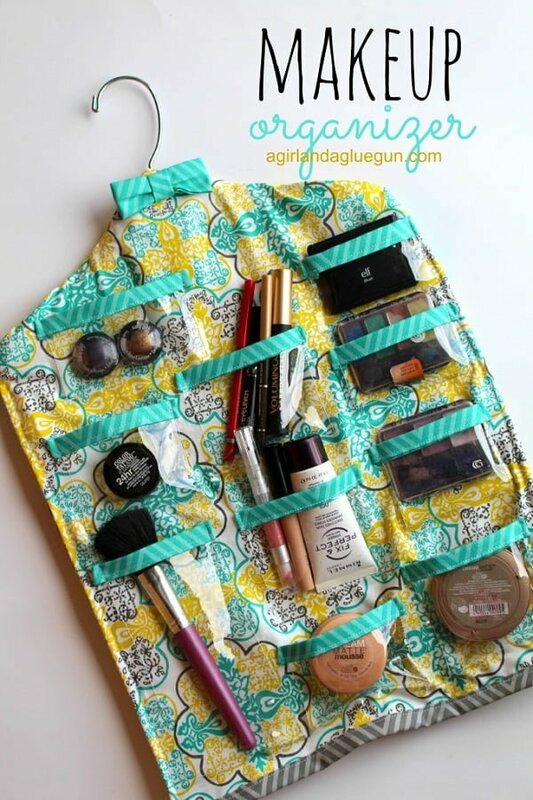 Fix misplaced twine if necessary, and show off your new makeup cup organizer to the world! Are you a fabric lover? Great, because we would like you to give this cute frame-inspired makeup organizer a try! For this task, you will need a two-colored fabric of your choosing, two-colored scrap fabric, Pellon Peltex, 1 box of Velcro, wonder clips, fading ink pen and a few more. Sewing techniques are also part of this project, so make sure you work concisely and precisely. The project itself offers a detailed tutorial, and with a bit of willpower and effort, you’ll be able to complete it within a day! Magnets are DIY miracle workers, and we found the ideal makeup project to get you experimenting creatively! Now, you’ll be able to organize your makeup like never before, and we’ll show you how it’s done. The first thing you’ll need for this DIY idea is a large photo frame, and a square metal piece to serve as its base. 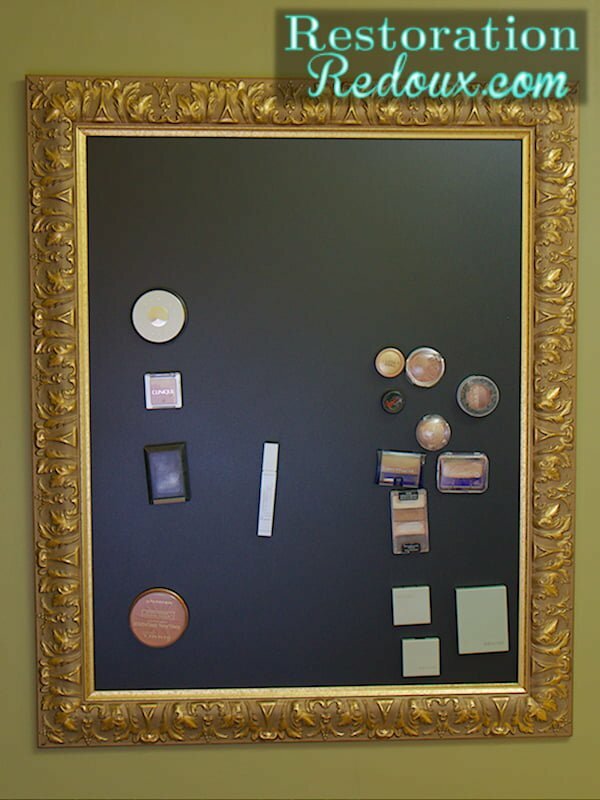 Then, choose your most essential makeup items and by using a glue, attach magnets to each of them. Last but not least, as your frame is quite big, make sure you find the perfect wall to hang it, thus making it the ideal décor element! Repurposing items can be a great idea for this next DIY project, and we are talking toilet paper rolls! 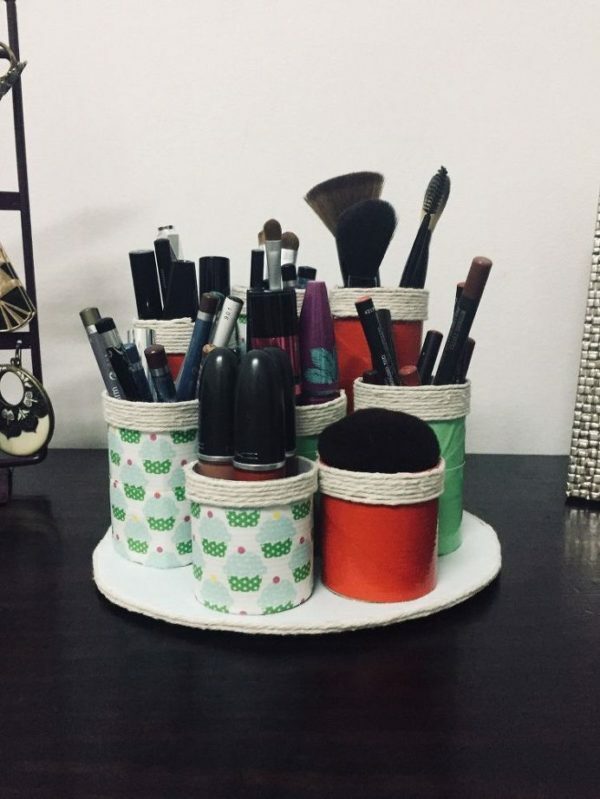 Toilet paper rolls are great for storing all your makeup, and if done right, these sure can make quite the impact in your home. For starters, you will need a handful of toilet paper rolls, masking tape in various patterns and cardboard as your base. Play with your rolls’ size and wrap them in patterns that work best for your space. Use a large cardboard piece to glue all holders together and exhibit your new makeup organizer tray where you most need it! 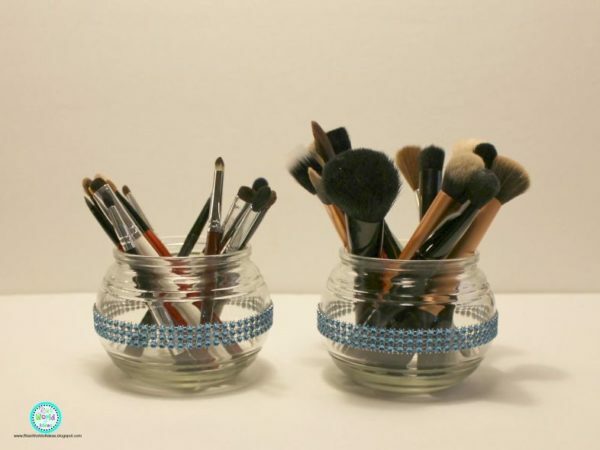 If you have Mason jars with no lids and no idea what to transform them into, let this DIY makeup organizer idea be your guide! The idea is quite simple but sure knows how to make a statement. All you need for this project is a set of no-lid Mason jars, and diamond ribbons to make them pop in color and design! You will also need glue and measuring tape to make sure your diamond ribbon is perfectly wrapped around each jar. Feel free to mix and match ribbon colors, thus delivering a sensational and creative DIY project! Presenting a precious DIY makeup organizer project, bound to catch your eye! This project is a bit more complex than the rest, but the end effect is definitely a dollhouse fantasy coming to life. As plywood is the basic element for this project, you will need a bit of experience in creating a nightstand-like storage for all your makeup and jewelry. As the perfect project to boost your crafting skills, this DIY makeup organizer comes with a thorough tutorial that is easy to follow, and an enjoyment to make! Most of all, this idea is all about the details, and delivers the perfect piece in return! 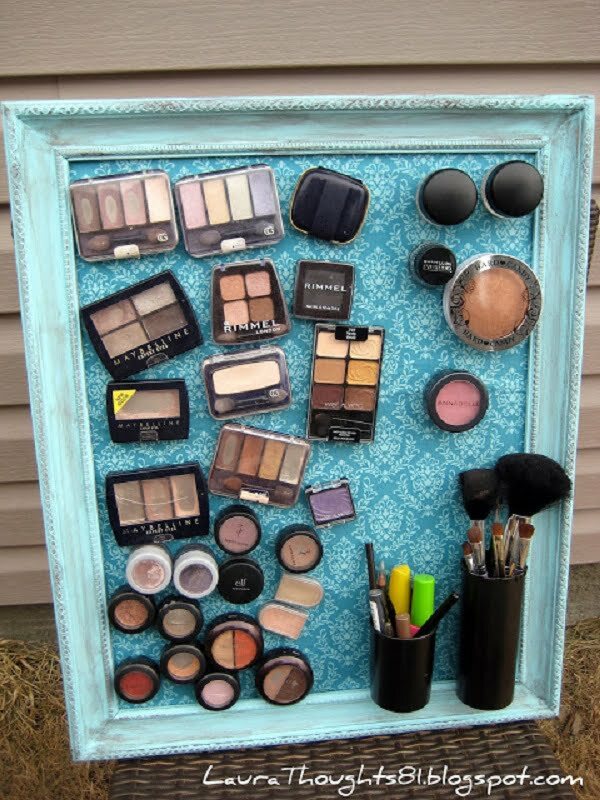 I bet you never thought that old cupboard drawers can be repurposed and turned into a fabulous makeup organizer! 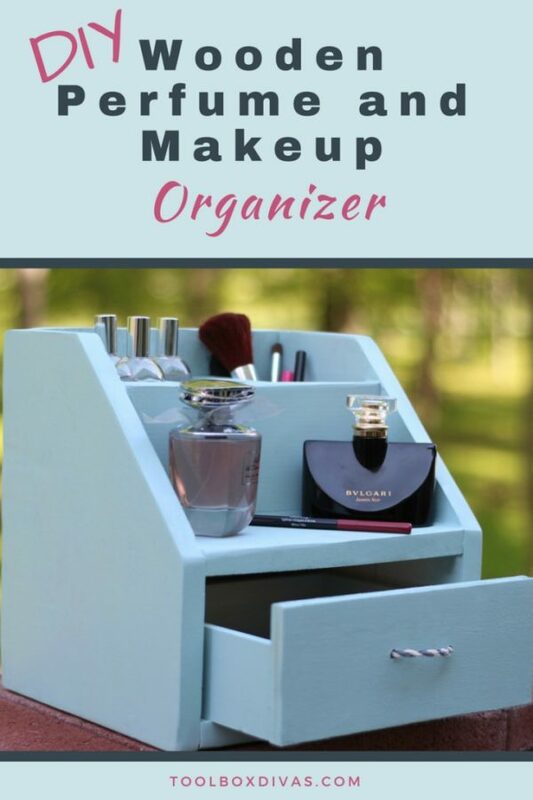 This lovely DIY makeup organizer focuses on a single-drawer design and offers enough storage for all your makeup items. To make the most of your space, use a well-cut cardboard to make partitions for each segment you store. If you have larger cosmetic items to store as well, make sure your cardboard frame is smaller, leaving you with just enough room to fit it all inside. 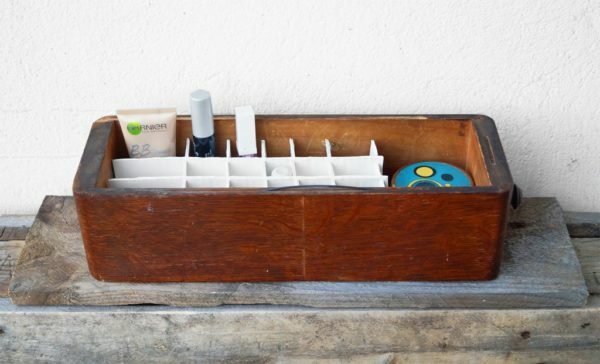 Charming and pleasantly vintage, this DIY makeup organizer idea is hard to resist! Transform your regular drinking glasses into daring and playful makeup brush holders! This project is perfect for anyone who likes keeping things fun an organized at the same time. 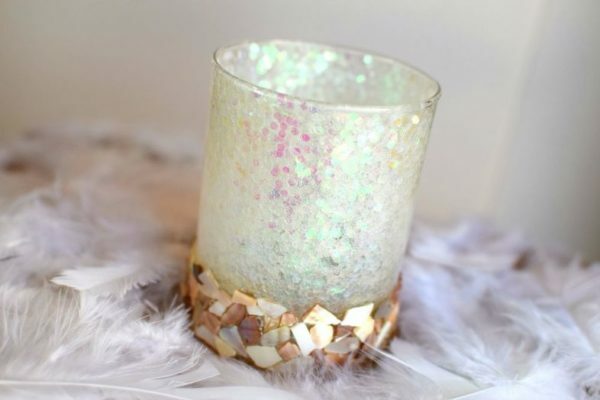 The elements involved in the making of this project include a set of glasses, a handful of sparkles to make it all shine bright like a diamond, some glue to keep it all intact and of course, creativity! This is where your innovative skills come to life, so play with dimensions and textures, accomplishing a masterful and trendy makeup brush holder that is so uniquely you! When we say wow, we mean it! This is makeup organizer that you simply cannot ignore, and here’s why! This particular project will cost you no more than $10, and all you need for it is already around your house. So, get your hands on a few salve containers. Remove labels and leave the white stand out. Next, find a black ribbon and glue it at the top of each container, thus delivering a yummy design. Finally, if you have a flower punch around, use it to create floral stickers, and glue them to your brand new and extraordinary makeup organizers! Nice, huh? 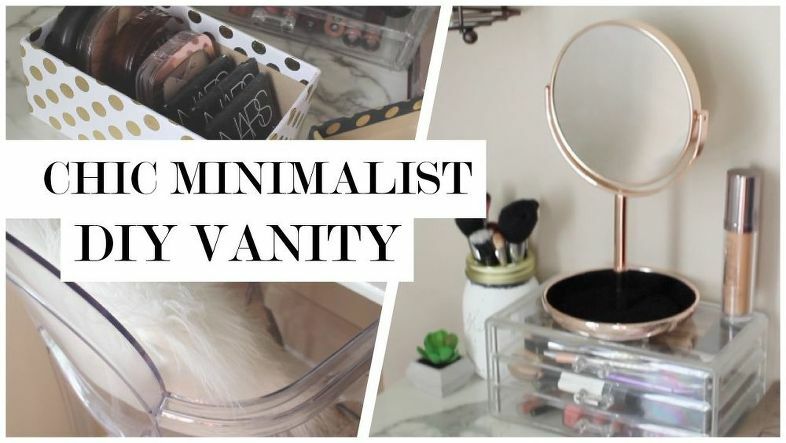 Willing to spend under $50 on a wonderful DIY makeup organizer project? Stay tuned, folks, we have just the idea for you! Check out this sophisticated and impactful makeup organizer project which is easy, affordable and just dreamy! To make it, you will need several elements, like a storage tower, a tray-like base and wall-hanging skills! Empty all your makeup and get rid of anything you don’t really use. Then hang your tower in a practical wall corner. 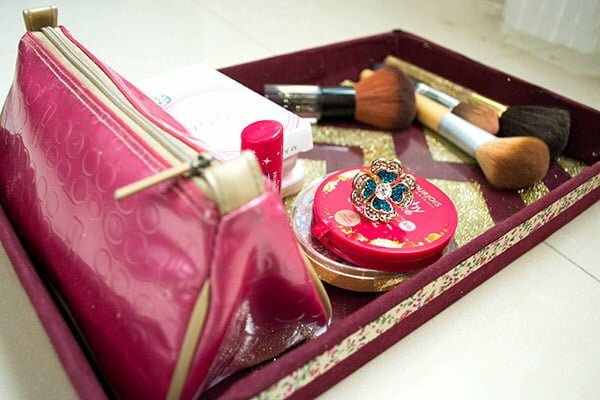 Place a shoebox lid, or any smaller tray inside the tower’s shelves and begin assembling your makeup! Minimalism never felt so good!